Hackensack University Medical Center Gift Shops are located throughout the medical center and offer a variety of products for your convenience and to help brighten the lives of patients. A dedicated group of volunteers will help you find a special gift for your friend or family member. Please be sure to visit us today! All profits from the gift shops sales further enable the Hackensack University Medical Center Auxiliary to support the hospital’s many medical programs. The Auxiliary’s efforts over the years have proven to be a great success. Gift Shop volunteers stock shelves, use a cash register, and help visitors and patients with shopping. If you would like to purchase an item to be delivered to your loved one’s hospital room you may do so by calling the Corner Shop. We are pleased to offer the opportunity to have a gift hand-delivered from any one of our shops to the friend or loved one who is in our care. Selection and prices vary. Please call for details. The Corner Shop located in the Banta Lobby offers a unique shopping experience, providing a wonderful array of personal gifts such as jewelry, handbags, scarves, and decorative items for the home. Brighten a patient’s day with stuffed animals, toys, games, balloons, floral arrangements, greeting cards and seasonal decorations. The shop is also a convenient source for newspapers, magazines, books, snacks, candy and toiletries. The Children’s Gift Shop is child-friendly and offers an array of gifts to delight younger patients as well as visitors and staff. Bright and colorful, this Shop is stocked with toys, children’s books and stuffed animals! Grab a chilled, refreshing beverage at this location, too. This is the only Shop that features our new HackensackUMC logo merchandise and apparel- an ideal gift for that special caregiver! The Dr. Earl and Ingrid Doyne Corner Shop is our newest addition. Opened for business in December, 2012, on the main floor, the facility offers both practical and luxury items for our patients, guests, and staff. The tranquil, welcoming environment enables our clientele to take a moment away from the clinical setting to enjoy selecting from a wide range of specialty products and beautiful gifts. Though dedicated to serving the unique needs of our cancer patients in particular, the boutique is well-equipped to serve all of our visitors. Shades of pink and blue, perfect for the new baby or two! The Sandra Kissler Women’s Shop caters to the newborn with gift items to mark the occasion of a new arrival. In addition, the shop offers preemie size clothing for those extra special bundles of joy. Items suitable for parents and young siblings are also available in the shop. A thoughtful gift of chocolate, fresh flowers, greeting cards, magazines, and stuffed animals will bring cheer to our patients. New mothers may also use the services of the Medela Rental Breast Pump Station. 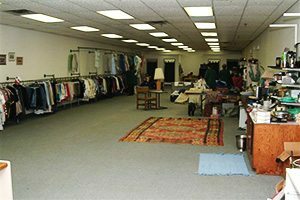 The Green Caboose thrift shop sells donated items such as gently used clothing, jewelry, children’s toys and books, holiday items, and a broad selection of household articles. There is always a surprise or two among the spacious rows of merchandise. Founded by the HackensackUMC Auxiliary and originally housed in the historic Anderson Street train station since 1962, the thrift shop became an integral part of the community. In January 2009, it was destroyed in a fire. The Green Caboose now continues its services in its new home on Orchard Street where it not only produces income for the medical center but provides two important services to the community: previously owned items are given a new lease on life; and those looking to clean out attics and basements have an ideal donation destination. Donations are accepted Monday through Saturday from 10:00 am to 4:00 pm. For additional information, please call 201-487-1462.